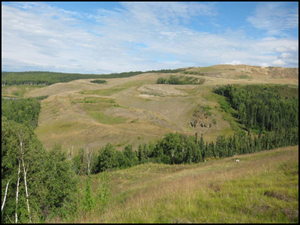 Revegetation is the process of covering bare ground (usually raw mineral soils) with native perennial plants, and is one of the primary activities of the Alaska Plant Materials Center. The Plant Materials Center can assist with seed mixture recommendations, application rates and application methods. Review reclamation plans for content and provide suggestions. Establish reclamation test plots around the state. Test plots are developed to coordinate trials and evaluate the results. Specie or species mixtures, seeding and planting methods might be a few of the reclamation treatments applied. Implement revegetation projects on the ground, monitor (qualitative and quantitative) and report. Assist companies and agencies with onsite species identification, seed collection, and processing and cleaning for future revegetation use. Conduct baseline vegetation survey (prior to site disturbances) from the site to be disturbed and reference sites nearby. 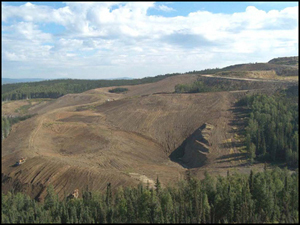 Reference sites will assist the client when determining a seed mix during reclamation. Site visits to conduct monitoring or to provide assistance with revegetation questions and problems.